Volleyball is a very popular sport in today’s world. Old and young alike enjoy participating in the sport. In order to make the game even more exciting use a glow-in-the-dark volleyball and net. The special volleyball and net can be found at local sporting good stores. In addition offer glow-in-the-dark necklaces and bracelets for people to wear. Before the reunion alert people to the glow-in-the-dark volleyball and ask them to wear any glow-in-the-dark clothing that they have. The necklaces and bracelets are available at many discount stores. Determine the boundaries for the game. The side boundaries are typically equal to the poles holding the net, and extend on both sides of the net to the determined back boundary. A team only scores when they are serving the ball, and the first team to reach 21 points wins. A server must serve from behind the back boundary without stepping over the imaginary line. A player continues to serve until their team loses the point, at which time the opposing team will then serve. The ball must never touch the ground, and can be hit a total of three times (never twice in a row by the same person) on one side in order to get it over the net. You can never catch or hold the ball, it should always be bumped (hit from below the waist) or set (hit from above the waist). Both hands or arms are used together when bumping or setting a ball. You can also spike a ball from the front line, which involves jumping into the air and hitting the ball with force onto the opponent’s side. There are many more rules for the sport, but these are the basic rules. 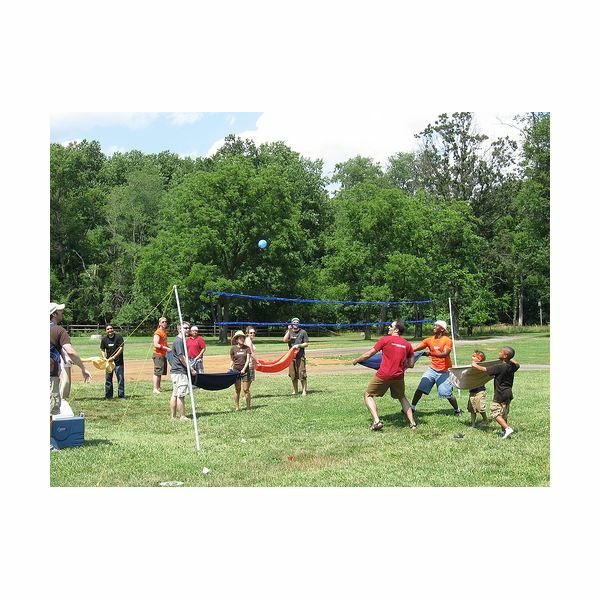 Playing volleyball in another new and different way, such as blanket volleyball, is fun for the entire family. As with the regular game of volleyball you need a volleyball, net, boundaries and players. Yet for blanket volleyball you also need one big blanket for each team or several smaller blankets per team (having several team members hold each blanket). Instead of one person serving the ball, it is placed in a blanket and the team works together to “launch” the ball over the net. In this version of volleyball, the opposing team must try to catch the ball with a blanket. The true challenge is getting the players to move together. The ball must never touch the ground or the other team earns a point. The game can also be played with water balloons instead of a volleyball for a more cooling game. Altered volleyball games are great games to play at a family reunion. Tossing a water balloon to a team member is a fun way to get wet and cool down on a hot, summer day. It’s also a good way to get to know someone new. One water balloon is needed for each pair. Make sure all water balloons are similar in size and shape. Everyone is paired with another person and faces their partner. Each team begins by standing an arm's length from their partner. The person holding the water balloon tosses it to the partner who must catch it without breaking it. If the catch is successful both players take one step back. The goal is to see which team can get the furthest apart without breaking their water balloon. How long have Uncle Mel and Aunt Sally been married? How old is Grandma Faye? These are examples of the types of questions you can use for a “family trivia” game. There are many ways to play this game. Questions can be made up before the event or even “on the spot.” You can choose to have people write down the answers to all the questions, and then determine the winner by who answered the most questions correctly. Drawing pictures to help people guess words is the goal of Pictionary. You can tailor the game to a family reunion by making all the words in the game relate to family reunions. For example, the word to be guessed could be party, and the person drawing would try to draw a picture that would make their team members guess the word. A white board with markers or a chalkboard with chalk is necessary to play the game. It should be big enough so that half the audience can see it at one time. You can make the words up before the event or have the people drawing make up their own words. Divide the participants into two teams. Only the drawer’s team members can guess their word. You can choose to allow the other team to guess the word if your team cannot get it. If your team does not guess correctly in an allotted amount of time, drawing privileges go to the other team. If your team guesses the answer correctly, drawing passes to the next person “in line” on your team.